Joel Topf, MD, FACP, is a Detroit native. Following undergrad at the University of Michigan he went to Wayne State University School of Medicine. During medical school he wrote a Microbiology Study guide which sparked his interest in education and information design. During a Med-Peds residency at Indiana University he co-authored a fluid and electrolyte text book which led to a nephrology fellowship at the University of Chicago. He is currently an Assistant Clinical Professor of Medicine at Oakland University William Beaumont School of Medicine, and teaches residents and fellows at St. John Hospital and Medical Center back in Detroit. 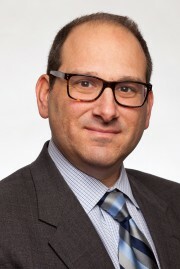 Since 2008 he has written a nephrology blog focused on teaching clinical nephrology at www.pbfluids.com. He is the co-creator of NephMadness and NephJC. Read Dr. Joel Topf’s posts.